Chanteur Rock 'n' Roll US né Henry Earl Sinks, le 1er Janvier 1940 à Witharral (Texas). Earl Sinks a été le remplaçant pour un temps très court, de Buddy Holly au sein des Crickets. Il est surnommé "The man with 1000 names" car il a utilisé plusieurs noms (Earl Henry, Sinx Mitchell, Earl Richards). Il est mort le 13 Mai 2017 à Goodlettsville (Tennessee). He was born on New Year's Day in Whitharral, Texas, near Littlefield, and not in Amarillo, as is alleged by some sources, although Earl did move there later in his youth. 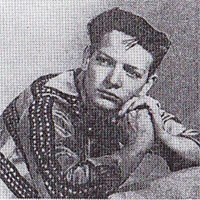 He appeared on Cal Farley's radio show in Amarillo before his first studio session (April 2 1958), which was probably backed by the Big Beats and produced by Norman Petty. 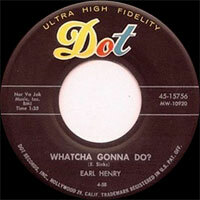 "Whatcha Gonna Do"/"I Am the Man" were released on Dot 15756, credited to Earl Henry, as was the follow-up, "My Suzanne"/"Believe A Traveler" (Dot 15875). In July 1958 Earl fronted Tommy Allsup's band in a supporting role for a Buddy Holly tour. Four months later he replaced Buddy in the Crickets and sang lead on their (three) 1959 recording sessions, resulting in the LP "In Style With the Crickets" and a few singles, classics like "I Fought the Law","When You Ask About Love" and "Love's Made A Fool Of You". 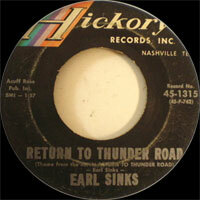 In 1959 or 1960 Earl moved to Nashville and would record all his further output there. While still with the Crickets (which he left in February 1960 after a disagreement), he recorded with a group called The Omegas, who had three singles released on Decca in 1959-60. These recordings are quite different than the Dot recordings and feature a saxophone (Boots Randolph, undoubtedly), but hold up well, thanks to the professional accompaniment of the Nashville A-team. 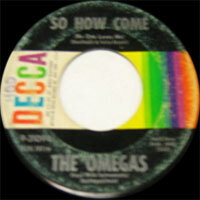 Among the Omegas singles is the original version of "So How Come (No One Loves Me)", which was later recorded by the Everly Brothers on WB. 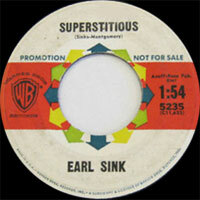 Also quite good were the two singles that Earl made for Warner Bros in 1961, "Look For Me" (with a prominent role for Floyd Cramer's piano) and "Superstitious". Both of these were also issued in the UK and credited to "Earl Sink". 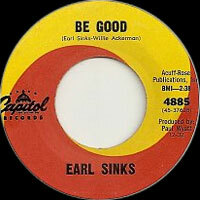 Next came two singles for Capitol (1962-63), the best of which was "Looking For Love" (Capitol 4985), though the Kris Jensen version of a few months later was even better. Earl had a country background (he had played with Ferlin Husky's band, the Hushpuppies, among others) and switched to country after being signed by Hickory Records in 1963. 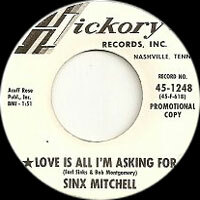 Among his singles for that label (initially credited to "Sinx Mitchell") was a pleasant revival of John D. Loudermilk's "Language Of Love" (Hickory 1315, 1965). In 1966, Earl played the lead role (as Earl "Snake" Richards) in the country music film "That Tennessee Beat", which also featured Merle Travis and (as themselves) Boots Randolph, Pete Drake and the Statler Brothers. Two more film roles followed, in "The Girl From Tobacco Row" (1966) and "White Lightnin' Road" (1967). These were low-budget productions. In March 1968 Bob Montgomery signed Earl to United Artists, the label where he would finally find chart success (as Earl Richards), albeit only on the country charts. His first UA single was a strong double-sider, "Maggie"/"Shake 'em Up And Let 'em Roll" (UA 50462). The latter song was written by Jerry Leiber and Mike Stoller and was recorded by several artists, including Kenny Ball in the UK. Jerry Leiber's own version from 1968 (with the Coasters, intended as a demo) was finally released in 1992 on Rhino's "50 Coastin' Classics" 2-CD by the Coasters. 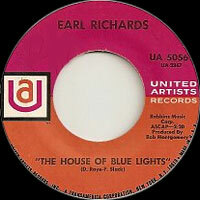 The second single on UA was a revival of "House Of Blue Lights", which peaked at # 39 country in October 1969. "Sunshine" was a smaller country hit one year later. In 1972 he was appointed manager of the Ace of Hearts label (not to be confused with the UK label of the same name) and bought the label with Gene Kennedy the following year. On Ace of Hearts Earl had four more entries in the country charts between 1973 and 1978, the most successful being "Margie, Who's Watching the Baby" (# 23, 1973). In 1976 Sinks launched the short-lived RPA label, for which he rerecorded "House Of Blue Lights" and an LP with that title. Since then Earl has worked as an independent producer with artists of the stature of Merle Haggard and Mel Tillis. He died on May 13, 2017 in Goodlettsville, Tennessee. 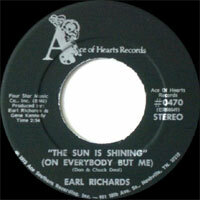 1975 SP ACE OF HEARTS 00501 (US) Earl RICHARDS - Lay Around / ?